Let's hear it for Peeta's buns! 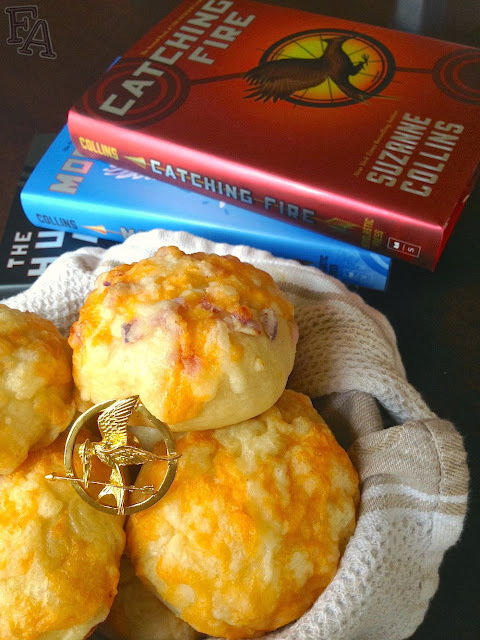 First mentioned in Catching Fire, the second book in Suzanne Collins' Hunger Games trilogy, these cheesy bread treats are Katniss' favorite. 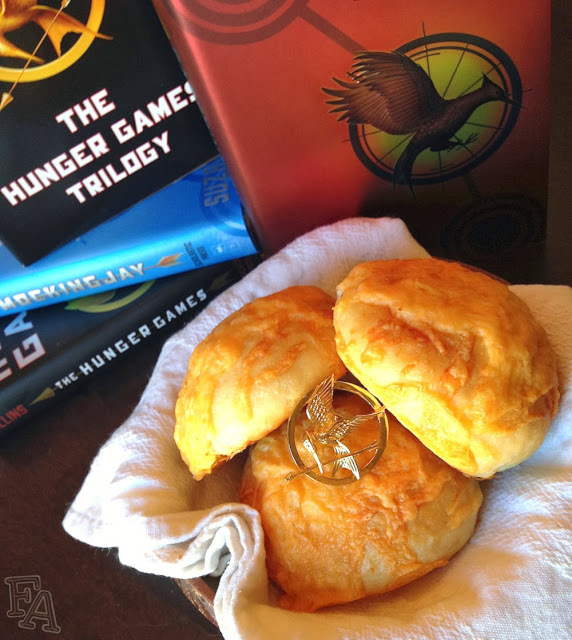 Once Peeta discovers this, in his never ending attempt to win her heart, he brings Katniss several buns each time he visits her in District 12's Victors' Village. 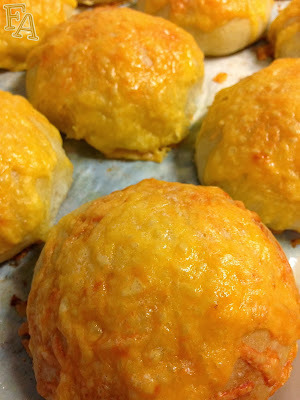 "From the bag I pull two fresh buns with a layer of cheese baked into the top. 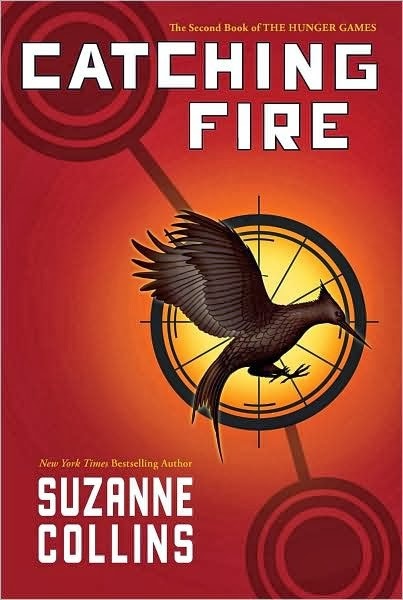 We always seem to have a supply of these since Peeta found out they were my favorite." —Katniss, Catching Fire, chapter 10. It's no mistake that Collins wrote Peeta as "the boy with the bread". 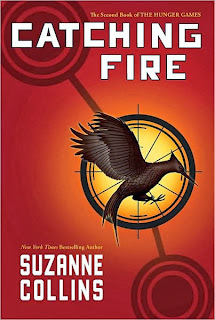 He is warm and comforting and wholesome, just like a fresh baked loaf, and is exactly what the aloof Katniss needs. Close your eyes and imagine a cheesy, warm, fresh-out-of-the-oven bun. Imagine the smell. Imagine what your mouth and tongue would experience. Now imagine all of those nights Katniss curled up in Peeta's arms. It's the same thing. Except instead of something for the stomach, it's something for the spirit. 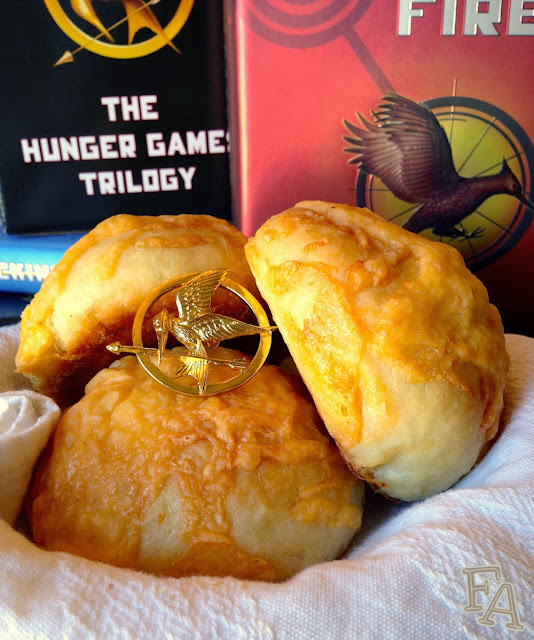 Peeta is the warm, cheesy bun for Katniss' soul. Note: There is a distinct difference between buns and biscuits. Buns rise with yeast and biscuits use baking powder, thus making biscuits more dense and buns, ideally, more fluffy. In the Hunger Games books they are specifically called "buns" so that means they need to be made with yeast like in the recipe directly below. I also have an awesome recipe for quick cheese biscuits though, so I've included it farther down in case you need some cheesy goodness in a hurry. 1. Combine the 1st 5 ingredients in a pot over medium heat, stirring occasionally so the milk doesn't stick to the bottom. Once the mixture gets foamy, turn heat to low & bring to a low boil. Remove the pot from the heat & let cool for about 15 mins. Whisk the flour & yeast together in a large mixing bowl & then make a well in the center. Pour in the milk mixture & mix with a dough hook attachment for about 8 mins. The dough will be sticky, but not terribly so. Dip your finger tips in oil (to handle the dough without getting it stuck to you) & scrape down the sides of the bowl. Remove the dough & form it into a ball. Pour a small amount of oil into the bowl & spread it around the bottom & sides using a paper towel. Place the dough back into the bowl & cover with a damp towel. Let rise for about an hour so the dough can (at least) double in size. 2. Punch down the dough. Line a large baking tray with parchment paper. Dip your fingers in a little bit of oil again to handle the dough. Pull off dough chunks to form balls a little smaller than tennis balls (you'll get about 12) & place on the parchment paper about 1" apart. Cover with the damp towel & let rise for another 10-15 mins (you can cut & shred your cheese at this time if you haven't done so already). Flatten each dough ball in the palm of your hand & place a chunk or two of mozzarella cheese in the middle. Fold the dough around the cheese, flip over, & gather the dough at the bottom. Roll the dough back into a ball & place it on the tray again. Let rest, covered, for a few more minutes. Suggestion: Meat. Put a little slice/chunk of meat in there with the mozzarella, like summer sausage or pepperoni, for a savory surprise. Note: You can certainly make the dough balls smaller, like golfball size. Just keep in mind that you'll probably need another tray, smaller mozzarella pieces, & that they'll bake for less time, about 15 mins or so. 3. Preheat your oven to 400°F. Whisk the egg wash ingredients in a small bowl, making sure to break up all of the egg bits. Using a clean kitchen brush, brush the egg wash onto the top & sides of each dough ball & then generously sprinkle with garlic salt. 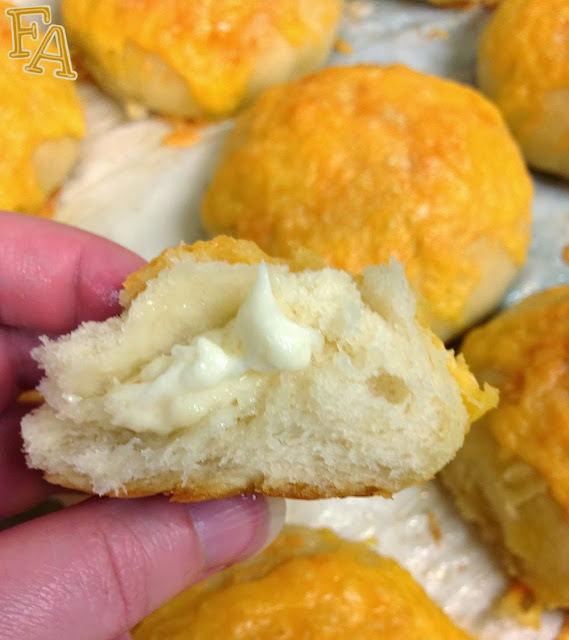 Pile the shredded cheese on like little haystacks, putting on as much cheese as you can (like, seriously, cheese those dough balls the heck up). Slide the bun tray into the oven & bake for 20-25 mins or until the cheese begins to brown at the very edges of the buns (about 15 mins if you made a smaller buns). Remove the tray from the oven & transfer the buns to a towel or cooling rack by picking up opposing corners of the parchment paper. Suggestion: Diced onion is a nice addition to these buns. If you're so inclined, dice up 1/2 a red onion & sprinkle it on the buns right before piling on the grated cheese. Tip: Do not store the buns in the fridge because it'll cause the bread to go stale quicker. Simply leave the buns at room temperature. If a few days have gone by & you still have a few buns left, wrap them in foil & heat in a preheated, 450°F oven for 5-10 mins so they'll taste fresh again. Or just zap 'em in the microwave for like, 30 seconds (without the foil, of course). 1. Preheat the oven to 350°F. Spray a cookie sheet with non-stick spray. Using a large spoon, mix all of the ingredients in a medium bowl. 2. Scoop golf ball sized "gobs" of dough onto the prepared pan, about 1" apart. 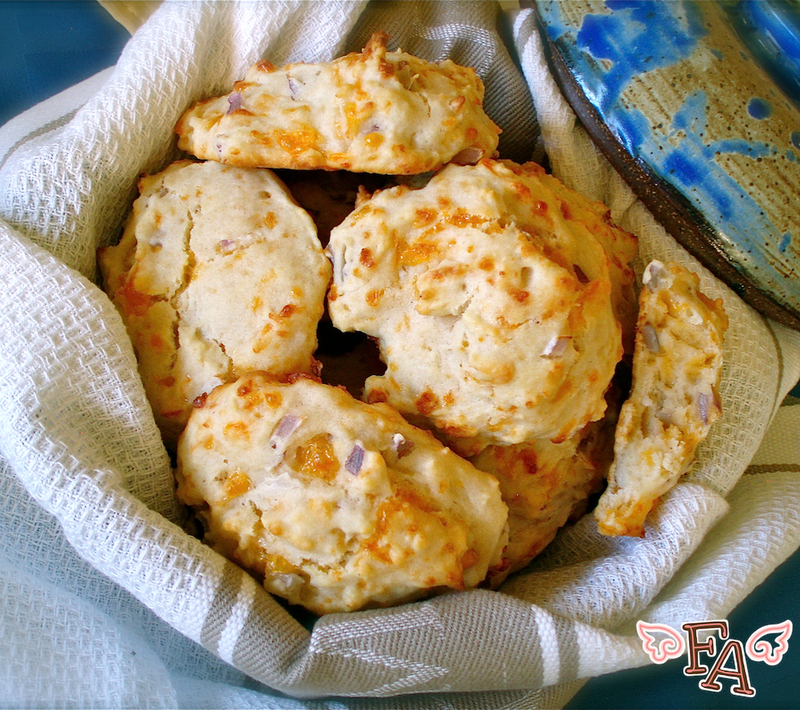 Bake for about 10 mins or until the biscuits are golden & the visible shredded cheese is golden brown. Remove from oven & serve warm. 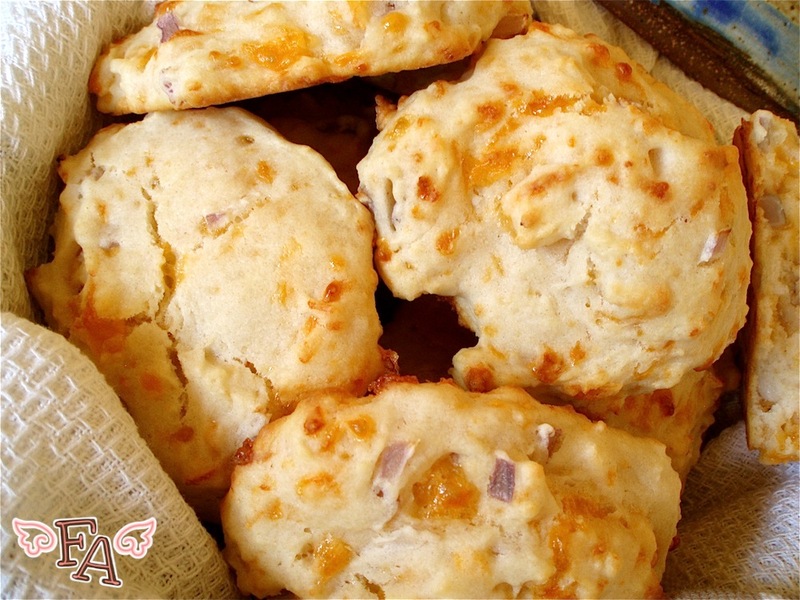 Suggestion: These cheese biscuits are awesome with finely diced red onion bits (see above photo), like, 1/4-1/2 cup depending on how much you love onions. Another yummy option is to add fresh herbs to the dough, like chives, basil, or oregano. Simply add these ingredients in the bowl with everything else & stir.